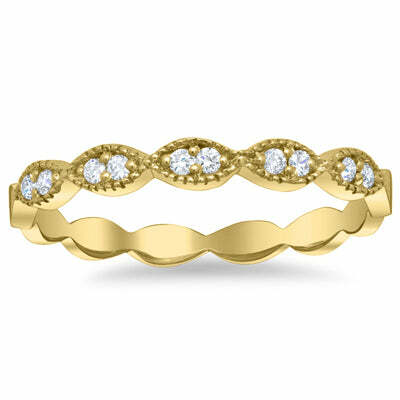 A diamond wedding band is the most popular choice for a woman today. They come in a large variety of designs and styles and also come in any price range. I wanted to showcase some of our most affordable diamond wedding bands that are currently available from deBebians. This simple diamond wedding band is delicate and our most affordable diamond wedding band currently. It features six round brilliant cut accent diamonds and has a width of 1.9mm. 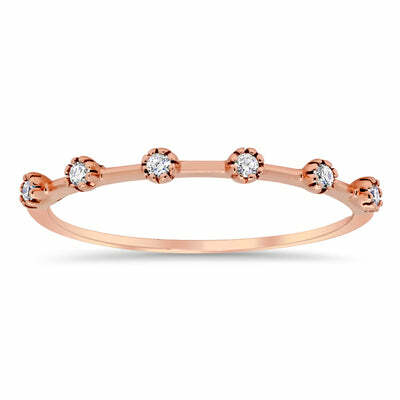 This ring is ideal for stacking due to its thin width. We use approximately 0.07 cttw of G-H color SI clarity diamonds. For a more antique look, one might consider this milgrained diamond wedding band. Set with round brilliant cut diamonds, this ring features 10 diamonds weighing approximately 0.10 cttw. We use G-H color SI clarity diamonds for this 2.5mm ring. 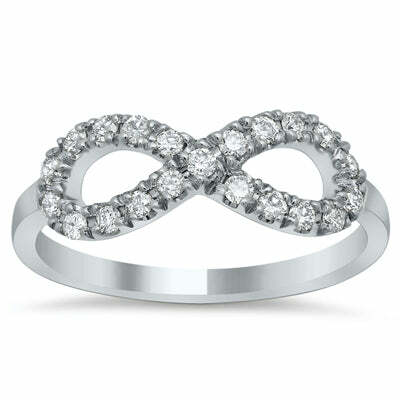 An infinity ring with diamonds is one of the most popular choices today. This ring is 6.5mm at its widest part and is set with 0.16 cttw of sparkling G-H color SI clarity diamonds. All of our diamond wedding bands are available in an array of precious metal options and finger sizes, which you may select from the provided drop-down menus. Please browse our entire collection of women’s diamond wedding bands to see all of the available designs from deBebians. We can work with virtually any budget and have a huge collection of rings to pick from.